The Nittany Track and Field youth club is kicking off its 2018 track season in a week - on April 30th. The club is open to any youth athletes in the age range from 7 to 18, and its main mission is to create environment for the kids to be introduced to the track and field as a sport, learn new skills, and train to achieve their athletic goals. The program is suitable for both experienced athletes and beginners. Events practiced include: sprints, distance, hurdles, jumps (long, high, triple), and throws (shot, discus, javelin). The practices will be held from 6:15 to 7:45 pm Monday through Thursday at the State College High School track until June 15th. Additional practices will be organized at other venues. The lead coaches for the summer program are Mark Fedkin, Josh Litofsky, Andrew Maguire, Matt Lindenberg, Wyatt Kline, and Jayson Jackson. The NTF will hold an informational meeting (including Q&A and uniforms try-ons) at Park Forest Middle School Cafeteria this coming Thursday (4/26) at 7 pm. Are you interested in learning about the optimal time and intensity to be training for maximal fitness? If so, Dr. Jinger Gottschall has a research opportunity that may be of interest to you. To participate, you must be between 20 to 55 years of age and train over 8 hours per week (with at least 10 minutes per week at an intensity greater than 85% heart rate max). Examples of this intensity include: interval training during swimming, cycling, running, or group fitness classes; exercises that involve jumping, squats, lunges, or burpees; team sports such as volleyball, basketball, soccer, or rugby. The study will include collecting heart rate data during your regular training sessions during a 3-week period followed by the completion of 2 high intensity training sessions on a single day. Dr. Gottschall is the professor leading this investigation within the Kinesiology Department. The purpose of this research is to assess the relationship between time and intensity for individuals who train regularly. We will collect survey data on your current activity, feelings, and sleep. In addition, we will collect 6 saliva samples during the high intensity session day to analyze substances related to stress. Each participant will earn a Polar A370 watch and H10 chest transmitter as well as feedback on their training quality. A hearty thanks to everyone who came out to donate, invited someone to donate, or helped someone get to the Nittany Valley Running Club’s Winter Blood Drive. The NVRC’s reason for hosting blood drives is to encourage healthy, able donors to come out because in some areas of the country, it hasn’t been possible. Thanks to you, we were able to help the American Red Cross in several key ways. January is National Blood Donor Month, the perfect time to resolve to give more life by being a blood donor. Winter weather and illness can make it difficult for the American Red Cross to maintain a sufficient blood supply at this time of year. Healthy, eligible donors are urged to give at this time. Severe winter weather has had a tremendous impact on blood donations already this year, with more than 200 blood drives forced to cancel, causing more than 6,500 blood and platelet donations to go uncollected. Donors in areas unaffected by the weather may be helping patients close to home or patients in areas where donors are unable to give because of inclement weather. With your generosity, we collected 17 units at this drive. That translates to saving up to 51 lives – which is no small accomplishment! Our presenting donors were treated to fresh Pizza Mia pizza, treats, movies (including the comedy “Run Fat Boy Run”) and camaraderie. Whether you were able or unable to participate in this drive, we encourage you to take a moment to put the NVRC’s Fall 2018 Blood Drive, set for Thursday, Sept. 13, on your calendar. When can you give? As often as every 56 days: If you didn’t donate on 1/18, we encourage you to donate soon at a drive that’s convenient for you. We hope to see you at the Sept. 13 NVRC drive. Thanks for supporting the American Red Cross and the NVRC! Nittany Track and Field (NTF) youth club starts its summer track season the first week of May and invites youth athletes from 7 to 18 years old to join. We create training opportunities in track and field events for both beginners and experienced athletes. Whether the kids have competitive goals or simply want to work on technique, strength, endurance, or just learn new things, NTF is a great place to spend some time during the summer. Practice starts May 2nd at the State College High School Track. The season will go through July 21st. Practices are scheduled from 6:15 to 7:45 pm Monday through Thursday each week! . Registration is open - here is the link to our Registration page with both paper and online forms. We have a great group of coaches coming back to work with kids this summer, and we plan a lot of different activities and events this season. Again this year, NTF Club will host the USATF-sanctioned Central Pennsylvania Youth Track Meet on June 3rd, which will provide a great competitive opportunity for all our athletes. For more information about the NTF club, practice schedule, meets, and other details, please visit our website www.ntfxc.com. It’s seven years in a row now. 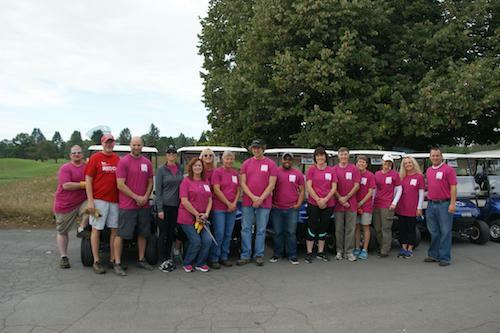 Cheree Jones helped to organize a crew of bushwhackers for the United Way Day of Caring, this time with the help of Liz Kisenwether. The project was again the golf course perimeter bikepath/jogging path, this time along the southwest edge of the Penn State Blue Golf Course along Blue Course Drive. Brush was also cleared at intersection of former railroad bed and road leading up to the Walker Clubhouse. The usual saplings, bushes, logs, branches, vines, and thickets had encroached on the jogging path. The volunteers were: Keller Williams Realty, Kid Tech, the Penn State Women's Softball and Lacrosse Teams (around 60 volunteers from among these groups, including over 20 from each of the PSU women's teams), and Joe Hughes--Penn State Golf Courses PGA General Manager/Head Golf Professional, who helped tremendously with the planning and execution, and Liz and Jim Kisenwether and Cheree Jones. The crew cleared the way so that runners have a clear treadway and golfers can see runners so they can yell "fore!". The NVRC, as usual, chipped in to pay for some food and refreshment. Here are a few pictures, courtesy of Cheree Jones. The Nittany Valley Running Club is now on Twitter. We plan to post links to articles on our own web site and on other sites with running-related content, links to podcasts of interest, and more. Follow us. Our handle is @nittanyrunning.